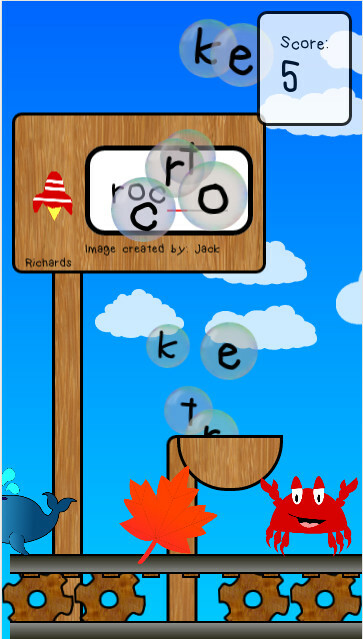 You can now download the free version of ABC Tap And Play: a fun spelling app for android phones and tablets that raises money for charity. Y9 iMedia students at Fulford School in York were given the challenge of learning how to design, create and optimise high quality images for the internet. To make the project more fun, we decided to create an app that would feature all of the images that students made. The brief for the students was to design and create copyright free, high quality cartoon style graphics to include in an app that would keep toddlers and young children busy for a few minutes on their parents’ smartphone or tablet. The plan was to launch a web-app that would work on any device, a free app that you could download and a paid app. The free website and app would contain adverts, the revenue from which would be added to the paid app sales and given to a charity that the students voted for. Just before Christmas, we launched abc.tapandplay.uk as a fun spelling game for children that you can play on any web-enabled device. Today, the free but ad supported app launched in the android store. Each student chose a charity that supported a cause that they cared about most and had to persuade the rest of the class why the money should be given to that organisation. This term, 100% of all advertising revenue from the website and app sales are going to support the amazing work that NSPCC do to support children across the UK. I’m dead proud of my students for their creativity and hard work designing and creating their images. We’ve raised around £20 in the month since the web version went live. That’s not loads, but with your help, we’d love to raise loads more.